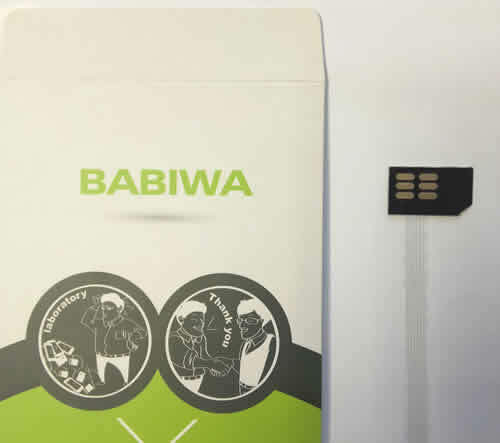 Genuine babiwa series No.YB-32D Customized MiniSimcard to Multi Simcard Flexible Flat Cable Extender (Support Extending up to 8 external Simcards). The Flexible Flat Cable Extender of Universal Mini-simcard Male connector to External 8 x Mini-simcard Female holder(also can hold 8x microsimcard and 8x nanosimcard). For you to extend out your device's original interior mini-simcard slot Then test most up to 8x simcards from outside easily . make sure your device's original mini-simcard bevel direction(angle) is Type D,as shown in the pic below. Support Plug and Play.Support Any devices (Models,Brands)using Universal Mini Simcard in Type D Bevel Direction. 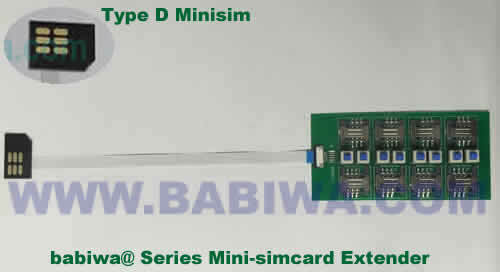 This linker is for your device to hold Type D Bevel direction(Angle) of Mini simcard slot (as shown in the pic below),please check carefully before your purchase.Because of the different designs related to different countries or areas,even the same brand's same model maybe comes with different Simcard holder's bevel direction .e.g. as Samsung S Galax Series. This listing is for No. YB-32D Mini-simcard male connector in Type D bevel direction to External 8x Mini-simcard female holder. if you find what you need is for different direction or simcard type etc,please choose other types from our listing catalog below,you could find all available at our Products Catalog.